Hugh Farmer: JH Stewart Lockhart was Colonial Secretary in Hong Kong from 1895-1902. He wrote a report to the Colonial Office in London, reporting on “The New Territory” . 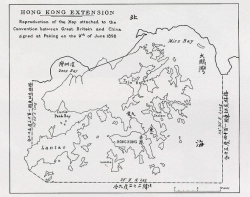 This followed “The Convention between Great Britain and China respecting an Extension of the Colony of Hong Kong.” The report was published on the 8th Oct 1898. 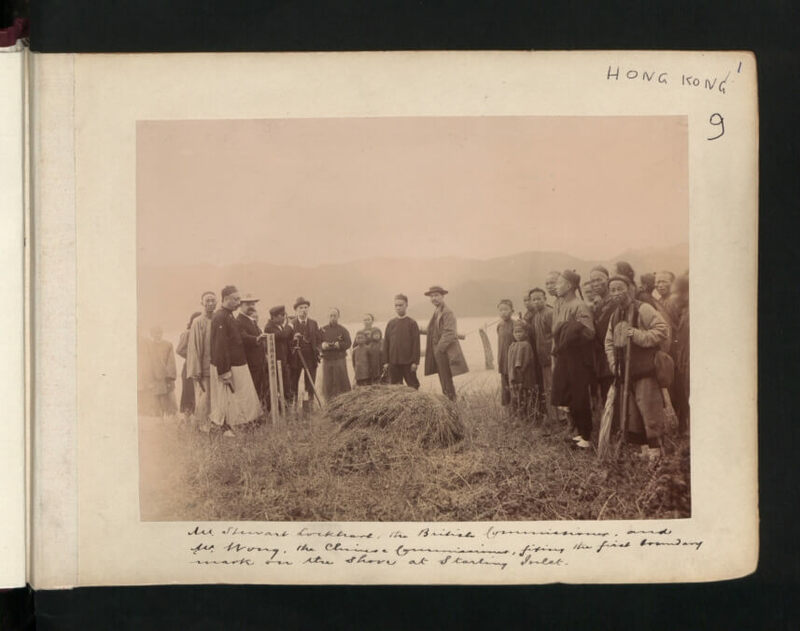 Paul Onslow has sent this photograph of “Mr Stewart Lockhart, the British Commissioner, and Mr Wong, the Chinese Commissioner, fixing the first boundary mark on the shore at Starling Inlet”. Undated, though probably August 1898. The image is from the UK National Archives collection of the Hong Kong colonial office 1869-1910. There is no restriction / copyright issue. Lockhart had made his inspection tour of the NT, including the outlying islands in August of that year. On his return he used the expression”the great difference”. Meaning the gulf between the New Territories and its inhabitants and the existing British colony and the people there. The report concisely describes various social and economic features of the NT and interestingly Lockhart strongly advocates retaining its local culture and traditions under British rule. There are various sections including some of interest to us:- Present Roads and Bridges, Proposed New Roads, Telegraph Line and Railway. However the section entitled Industries, is the obvious place to start to gain a little understanding of what activities were taking place in the NT as it became part of Colonial Hong Kong. The population [ which was estimated to be about 100,000] is chiefly occupied in the cultivation of the soil with the various crops produced. But in addition to agricultural pursuits there are large fisheries in which many persons are engaged, in the bays surrounding the territory on the east, south and west, fishing being carried out chiefly by means of stake-nets. The fish are sorted, salted and sun-dried and exported to various markets. The trade in salt fish is one of the most important and employs a large number of persons. Pearl fisheries exist in Tolo harbour where pearls of value are sometimes said to be found. In addition to salt water fish the rearing of fresh water fish in ponds for the Hongkong market and elsewhere occupies the attention of the villagers of the Un Long division. The cultivation of oysters is also carried on to a large extent, especially in Deep Bay. Lime burning is an important industry, coral and oyster shells being burnt in the place of limestone. 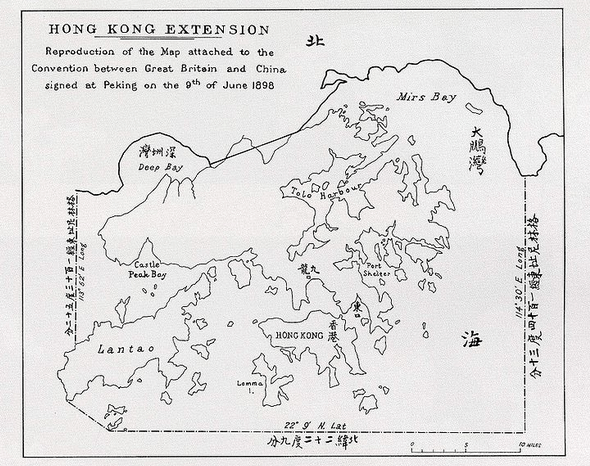 The largest limeburning works seen were near Castle Peak Bay where coal obtained from Hongkong was being used as fuel. Lime was also being burnt at Taipo hoi, Sha-Tau-Kok, Sha-Tin, Ts’un Wan, Ping Shan and other places visited. It is understood that a great deal of the lime used in Hongkong is imported from the San On district. The manufacture of bricks and the quarrying of stones enable the inhabitants to obtain building materials at a cheap rate. Salt is manufactured in several places. Salt pans were seen at Sha-Tau-Kok and Castle Peak Bay. The indigo grown in the district is used for dying cloth, both men and women being employed in the work of dyeing. Boat-building is carried on. A boat-building shed was seen on the shores of Mirs Bay. A large establishment exists near Ts’un Wan for the manufacture of joss-powder, out of which joss-sticks used in the worship of idols are made. The powder is made from fragrant wood, which is pounded into dust by means of water-wheels, six of which were seen at work. Although there is a large source of water throughout the territory available for water power, this is the only instance in which we saw water utilised for manufacturing purposes. Ropes and nets are manufactured out of the hemp which was observed growing in various places. One village we visited was engaged entirely in the manufacture of pottery, the clay for which is found in the mountain immediately above the village. The villagers are said to have learned the art of manufacturing pottery from an Italian missionary who formerly resided among them. In almost every village is carried on the rearing of pigs, large numbers of which are exported annually. Pine trees are grown and cut down for firewood which is an important article of export. Poultry breeding and fruit growing for the Hongkong market form lucrative occupations for many villages. With the introduction of capital, which is sure to follow when the territory comes under British occupation, and with that feeling of greater security which just government is bound to inspire, the present industries will be greatly developed and new industries will be created. We already have some information about several of these either post 1898 in the NT or elsewhere in HK. For example incense, indigo, pottery, quarrying, rope making and salt production. It would of course be of great interest to know more about these activities in the NT prior to 1898 and from then up to the present. [If you hadn’t already guessed, Lockhart Road on HK Island is named after the Colonial Secretary].